Vinnie Vinh is a Vietnamese-American from Houston, Texas. Vinnie travels across the country, playing in the biggest poker tournaments he can find. He has put together an impressive string of poker success, making the money in more than 40 different poker tournaments since 2001, with six of them being first place finishes. Vinh is known for screaming out his name, “Vinnie Vinh!” whenever he gets excited after a great hand. Vinnie’s biggest payout so far has been his second place finish at the World Poker Tour’s LA Poker Classic, where he left with $718,485. 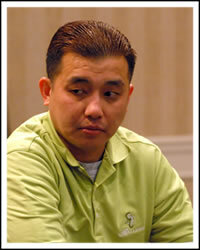 Vinnie Vinh won a 2005 World Series of Poker Circuit Event in Indiana, earning $430,000. To date, (February, 2013), Vinnie Vinh has nine first place finishes and has won more than $2.3 million in poker tournament winnings.